It takes courage to break free from the shackles of social inequality. It takes enormous amounts of courage to believe that things can change. It takes a leader to fight these inequalities and establish a new social order. Babasaheb Dr Bhimrao Ramji Ambedkar was a scholar, a social reformer and a leader who dedicated his life to eradicating social inequality in India. He established an India of equals, a country which provided greater opportunities for people who were historically disadvantaged. Babasaheb’s family was from the Mahar community and came from the Ambavade town of Mandangad taluka in the Ratnagiri district of Maharashtra. However, he was born in the military cantonment town of Mhow, now in Madhya Pradesh on 14 April 1891 as his father was then a Subedar Major with the Mahar Regiment of the Indian Army. He went to a government school where children from lower castes, regarded as untouchables, were segregated and given little attention or assistance by the teachers and not allowed to sit inside the classroom. Students from the community had to go without water if the peon did not report for duty. In 1894, Babasaheb’s family moved to Satara in Maharashtra, and his mother passed away shortly after their family moved to Satara. His teacher Mahadev Ambedkar, a Brahmin, was fond of him and changed his surname from ‘Ambavadekar’ to his own surname ‘Ambedkar’ in school records. In 1897, Babasaheb’s family moved to Bombay. He married Ramabai in 1906 when he was 15 and Ramabai nine years old. This however, did not deter him in his academic pursuits as he passed the matriculation examination in 1907 and entered the Elphinstone College the following year, becoming the first person from an untouchable community to do so. By 1912, he obtained his degree in Economics and Political Science from Bombay University and took up employment with the government of the princely state of Baroda. This opened up new avenues for Babasaheb as he got an opportunity to pursue his post-graduation at the Columbia University in the United States in 1913 through a Baroda State Scholarship instituted by the Gaekwads of Baroda awarding £11.50 (Sterling) per month for three years. He passed his MA exam in June 1915 majoring in Economics, with Sociology, History, Philosophy and Anthropology as other subjects of study; he presented a thesis ‘Ancient Indian Commerce’. In 1916 he offered another MA thesis, ‘National Dividend of India – A Historic and Analytical Study’. On 9 May, he read his paper ‘Castes in India: Their Mechanism, Genesis and Development’ before a seminar conducted by the anthropologist Alexander Goldenweiser. In October 1916 he studied for the Bar examination at Gray’s Inn, and enrolled at the London School of Economics where he started work on a doctoral thesis. In June 1917 he was obliged to go back to India as the term of his scholarship from Baroda ended, however he was given permission to return and submit his thesis within four years. He was appointed as Military Secretary to the Gaekwads of Baroda but had to quit within a short time, pushing him into financial hardship. In 1918 he became Professor of Political Economy in the Sydenham College of Commerce and Economics in Bombay and though he was very popular with his students, he had to face discrimination from his colleagues. It was during this period that Babasaheb started taking greater interest in politics as he was invited to testify before the Southborough Committee, which was preparing the Government of India Act 1919. During this hearing he argued for creating separate electorates and reservations for untouchables and other religious communities. In 1920, he began publication of the weekly Mooknayak in Mumbai with the help of Chhatrapati Shahu Maharaj, Maharaja of Kolhapur. A social reformer, the Maharaja played a pioneering role in opening up education and employment to people of all castes. Babasaheb continued to fight for justice for the untouchables in the years that followed, as a practicing lawyer and as a social reformer. By 1927, he decided to launch active movements against untouchability and espousing access to public drinking water resources and the right to enter Hindu temples. He led a satyagraha in Mahad to fight for the right of the untouchable community to draw water from the main water tank of the town. He was appointed to the Bombay Presidency Committee to work with the Simon Commission in 1925. While the Commission had faced protests across India and its report was largely ignored, Babasaheb himself wrote a separate set of constitutional recommendations for the future. Babasaheb was invited to attend the Second Round Table Conference in London in 1932 but Mahatma Gandhi was opposed to a separate electorate for untouchables as this would split the nation. In 1932, the British announced a Communal Award of a separate electorate, Gandhi ji protested by fasting while imprisoned in the Yerwada Central Jail of Poona. This resulted in an agreement widely known as the Poona Pact in which Gandhi ji ended his fast and Babasaheb dropped his demand for a separate electorate. Instead, a certain number of seats were reserved specifically for the ‘Depressed Class’. In 1935, Babasaheb was appointed principal of the Government Law College in Mumbai and continued in that position for two years. He lost his wife Ramabai during this period and this marked the beginning of an important chapter in Babasaheb’s life. On 13 October that year, he announced his intention to convert to a different religion and exhorted his followers to leave Hinduism while speaking at the Yeola Conversion Conference in Nasik and repeated his message all through the country. In 1936, Babasaheb Ambedkar founded the Independent Labour Party, which contested the 1937 Bombay election to the Central Legislative Assembly for the 13 reserved and 4 general seats, securing 11 and 3 seats respectively. He served on the Defence Advisory Committee and the Viceroy’s Executive Council as minister for Labour during this period. This is also the period when Babasaheb wrote extensively on the condition of Dalits and the caste system in Hindu society. During this period, Babasaheb renamed his party as the Scheduled Castes Federation which later evolved into the Republican Party of India. He was initially elected to the Constituent Assembly from Bengal but his seat went to Pakistan following the Partition of India. He was subsequently elected from the Bombay Presidency in place of a senior jurist Jaykar, ahead of Shri GV Mavalankar. India became an Independent nation on 15 August, 1947 and Babasaheb Ambedkar was appointed as the Union Law Minister and Chairman of the Constitution Drafting Committee, which was given the responsibility to write India’s new Constitution. 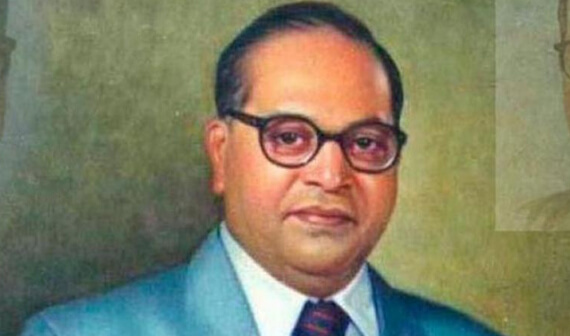 Babasaheb Ambedkar’s text provided constitutional guarantees and protections for a wide range of civil liberties for individual citizens, including freedom of religion, the abolition of untouchability and the outlawing of all forms of discrimination. Granville Austin described the Indian Constitution as ‘first and foremost a social document’. He argued for equality and also won wide support for introducing a system of reservations of jobs for members of scheduled castes and scheduled tribes in the civil services, schools and colleges. This was aimed at providing a voice to people who had suffered grave injustices through centuries. The Constituent Assembly formally approved the draft Constitution on 26 November 1949 and Babasaheb’s greatest work, the Indian Constitution, became our way of life on 26 January 1950. Struggle was a part of Babasaheb’s life as he had to work hard for everything he achieved. While he is remembered for his relentless crusade for a new social order, the Indian nation shall always remain indebted to him for giving us a Constitution that defines our core values as a nation. He was the man who made us a nation of equals.